Embroidery is the very first craft I ever learned. It was de rigeur at my elementary school, perhaps as a way to instill focus and hone fine motor skills. Whatever the reason, I’m eternally grateful (shout out to Marin School in Albany, California!) because I love embroidery to this day! I appreciate the relaxing rhythm of a needle pulling thread, and too, I love that embroidery is so self-contained and versatile. I recently felt a new burst of embroidery inspiration while I was stitching my Felted Wool Hot Water Bottle Cover project. 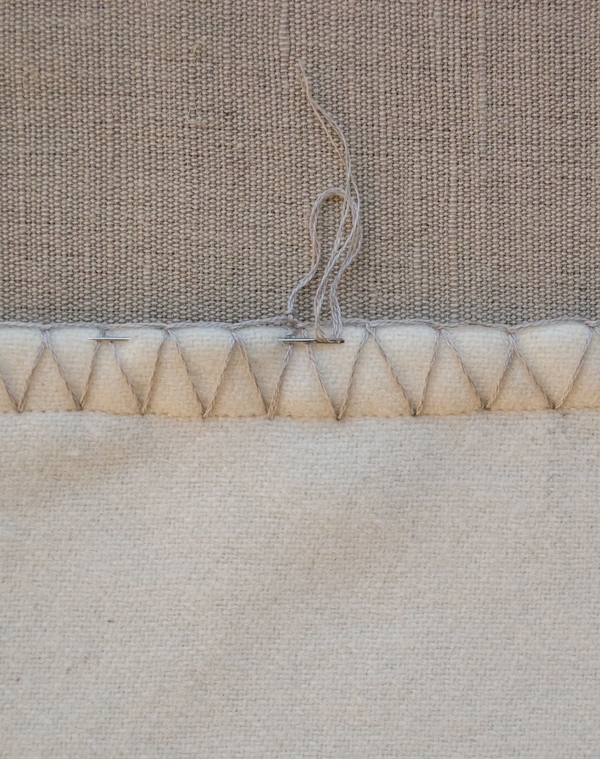 I was fascinated by how the zigzag blanket stitch instantly transformed something plain into something extraordinary. 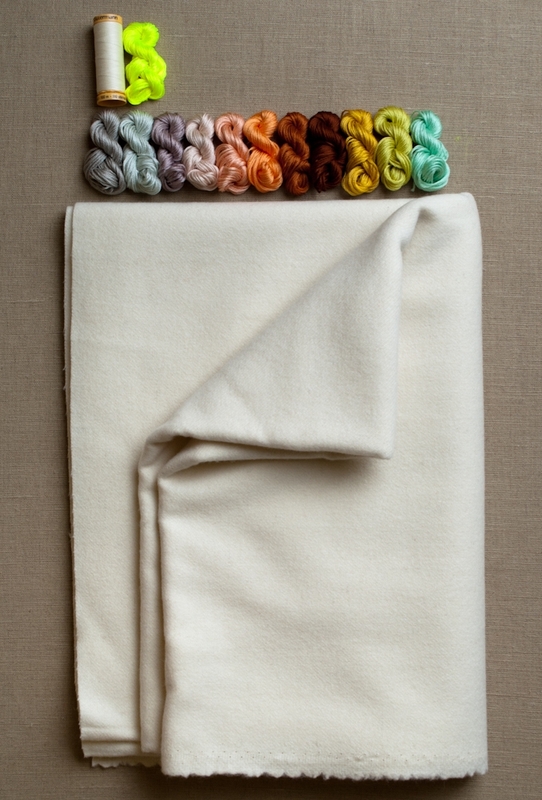 And so, armed with a yard of Dorr Mill’s Wool and a whimsical spring rainbow of DMC Floss, this Ombre Edge Throw was born! This project is super quick to make but looks so considered and elegant. I originally intended it to be a couch throw, good for curling up and watching a movie, but once it was done, I couldn’t resist the urge to wear it as a scarf as well. 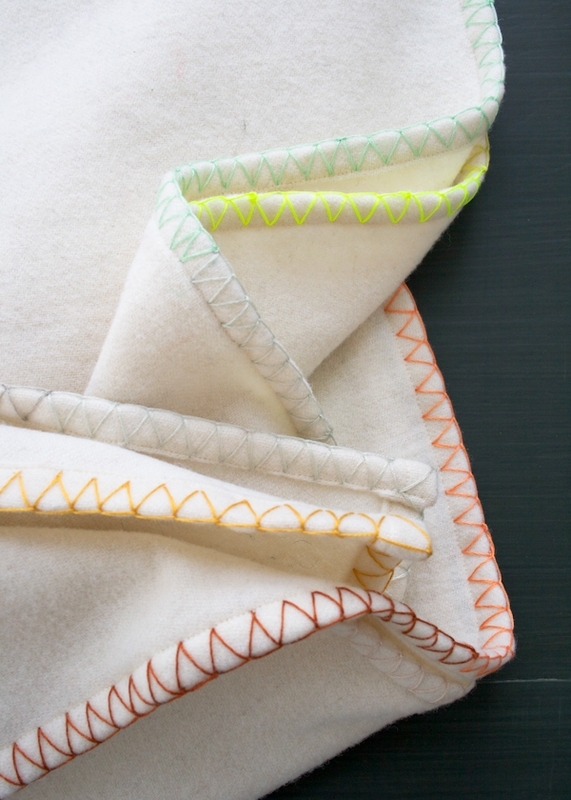 The Ombre Edge Throw is one of those great, versatile projects that can be anything you want… kind of like embroidery itself! Before you get started you’ll need to felt the wool by machine washing it in hot, rinsing it in cold and machine drying it for 20 minutes. 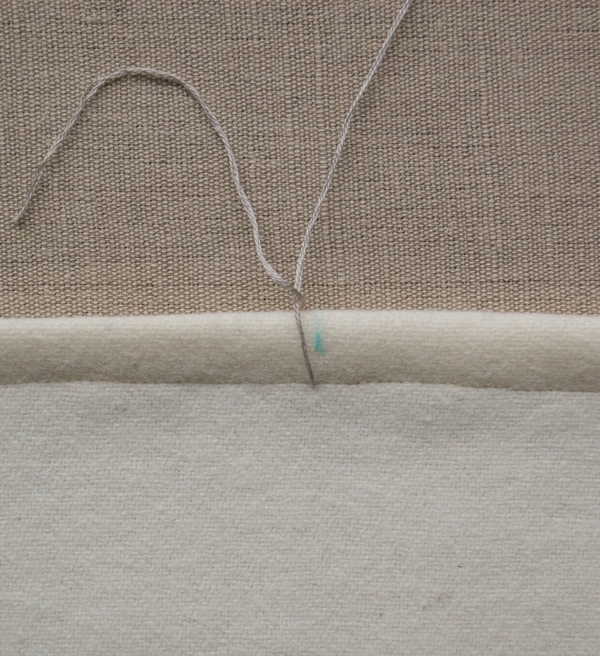 Trim the selvages off the felted piece of wool and then cut all four sides straight so that every corner is a 90-degree angle and the whole piece is a rectangle. The exact finished measurements will be different for everyone depending on how felted the wool is and how much you cut off to get the edges straight. Press and pin one of the long edges over 3/8 inches twice towards the wrong side. Sew this fold down with an edge stitch using the sewing thread. Hem the other long edge in the same manner. Hem both of the shorter edges in the same way. Make sure to sew all of these seams as straight as you can because they will be a guide for the embroidery later. Once all four sides are hemmed, carefully measure the entire perimeter of the rectangle. My perimeter was 174 inches. Divide this by 12 to get your Marking Distance. For me, the Marking Distance was 14 1/2 inches. 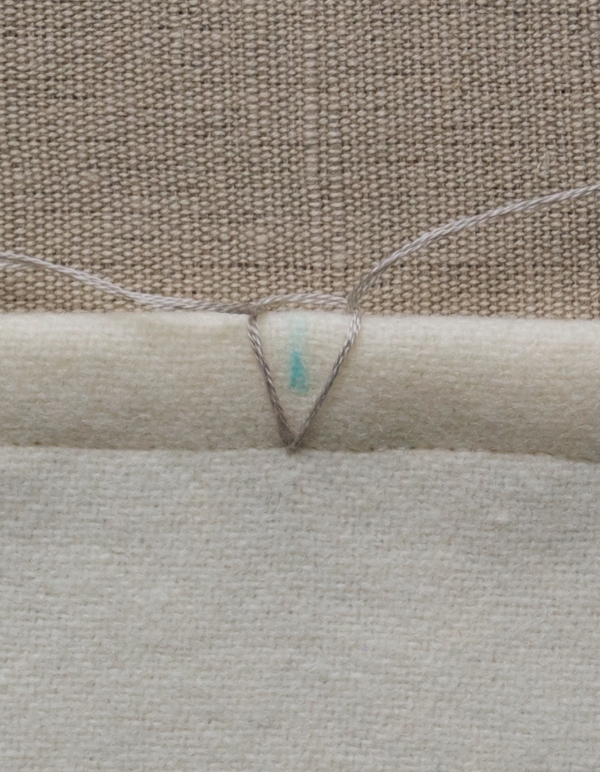 Starting at the middle of one of the edges, make a mark on the edge of the right side hem using the water soluble fabric pen. Make a second mark one Marking Distance from the first mark. Make a third mark one Marking Distance from the second, turning around the corner if necessary. Keep marking along the edge of the right side around the entire perimeter. 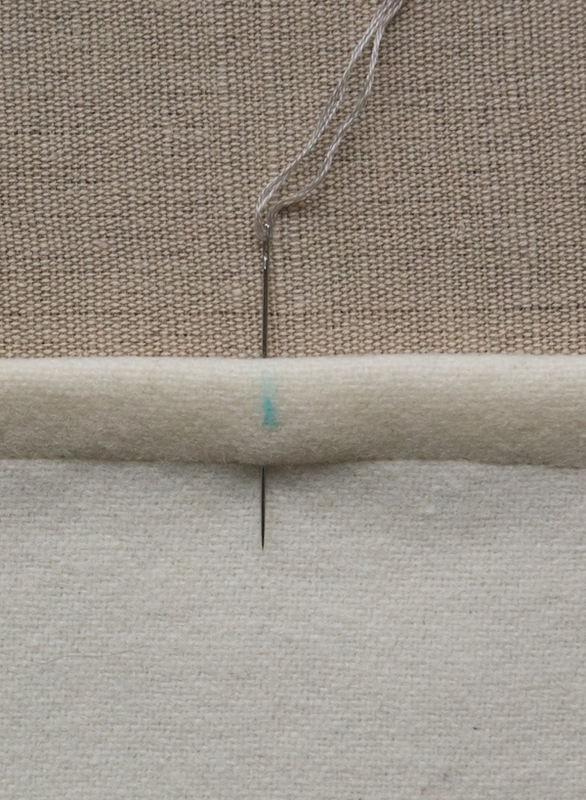 Once you get back to the first mark, the edge will be divided into 12 sections, one for each color of embroidery floss. 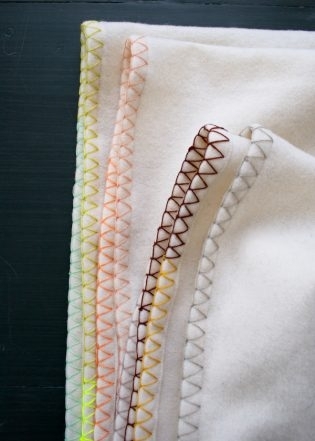 Notes: Use three strands of the embroidery floss for all of the embroidery in this project. 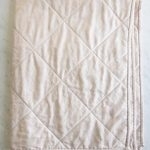 Work with the right side of the throw facing you, so that the hem folds are in the back and the marks are on the front. Thread an embroidery needle with a 24-inch length of thread. 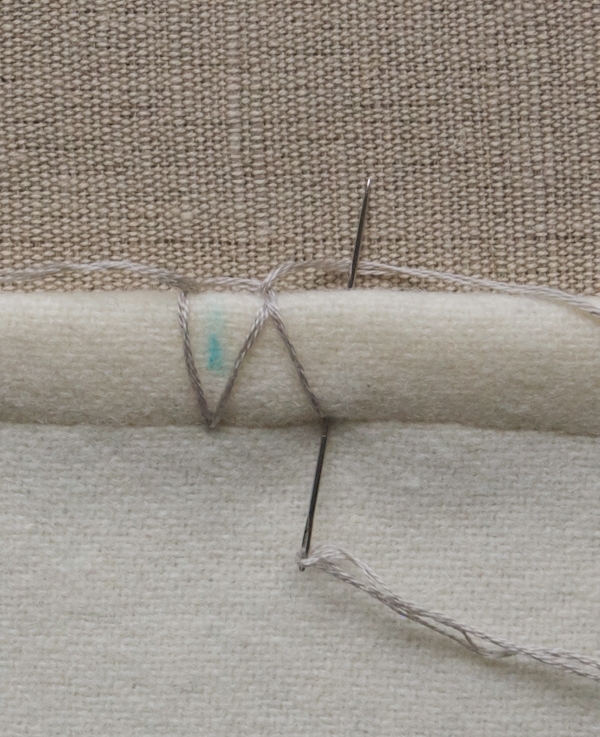 Starting at the first mark, push the needle from the back to the front at the stitched seam. Instead of tying a knot, leave a 4-inch tail and bring the working floss behind this tail. 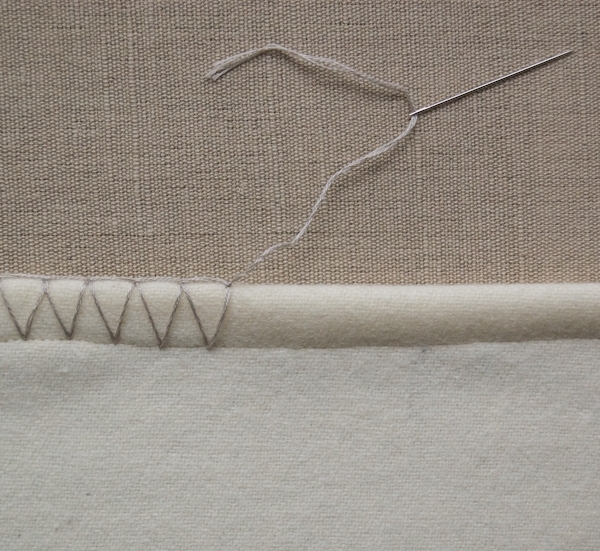 Pull the tail to the left, causing the stitch to angle to the left. From the front side, insert the needle 3/8 inch to the right of the bottom point of the first stitch. Pull the needle through, but do not pull it taut yet. 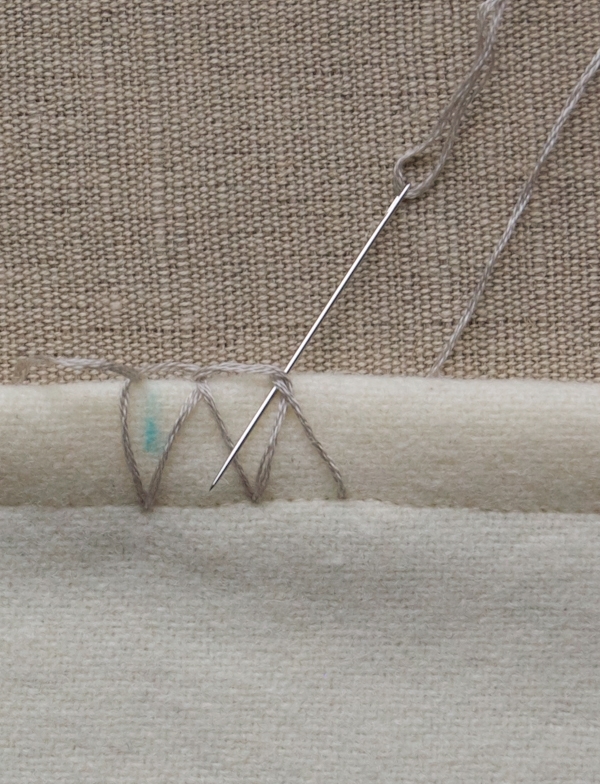 Instead, insert the tip of the needle, from right to left, under the X-shaped intersection at the top of the previous stitch. Pull the floss taut. 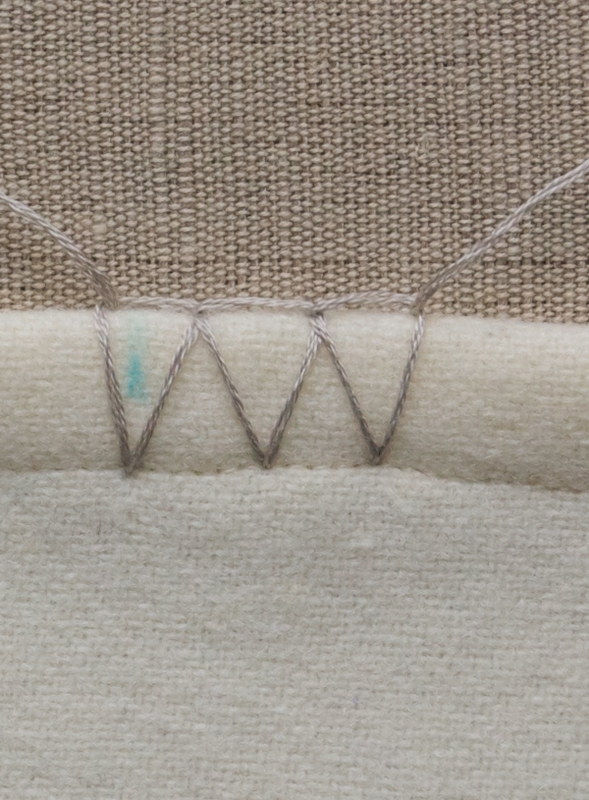 It should be anchored to the top of the previous stitch and angled to the left. Just as you did previously, insert the needle from front to back 3/8 inch to the right of the bottom point of the previous stitch. Pass the tip of the needle under the X-shaped intersection at the top of the previous stitch. Pull the floss taut. 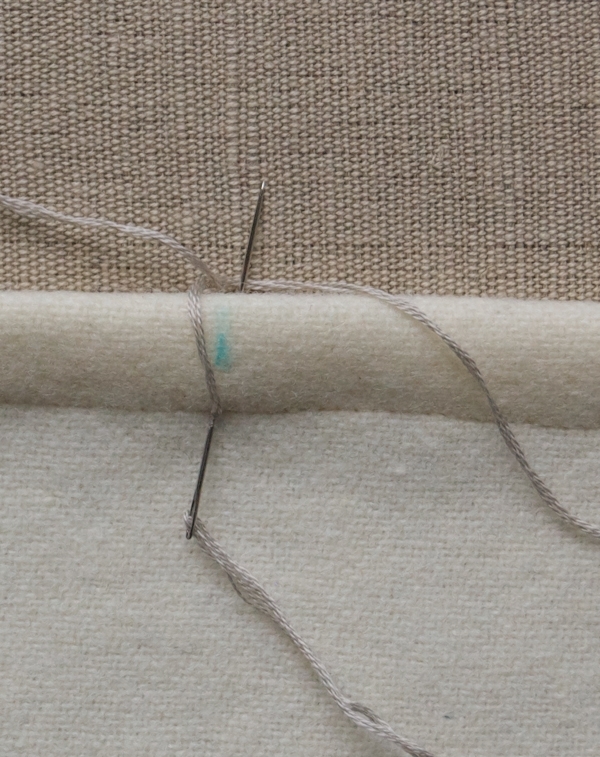 Keep stitching in this manner until you have 4 inches of floss left. Tie a small overhand knot at the top right corner of the last stitch. 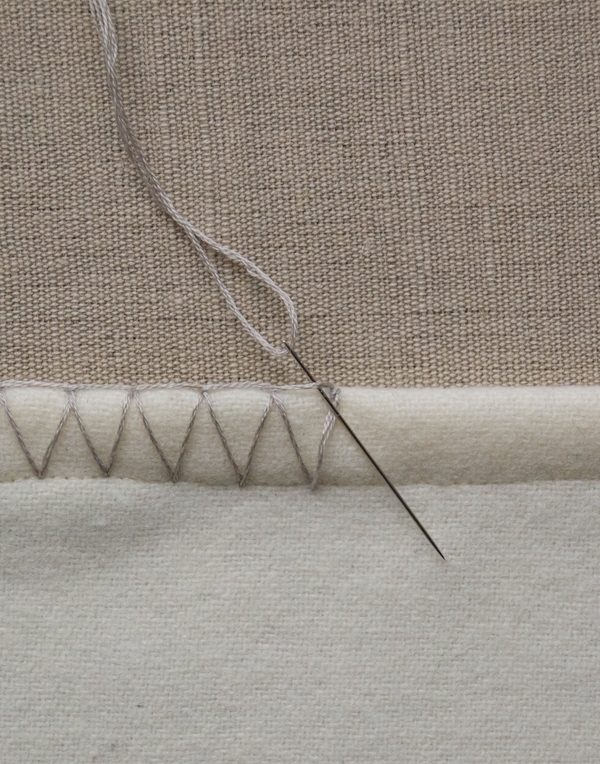 To start with a new length of floss, or a new color, pull the needle from back to front through the top of the last stitch. Insert the needle 3/8 inch to the right of the bottom point of the last stitch. Coming from the back, insert the tip of the needle under the X-shaped intersection at the top of the last stitch. 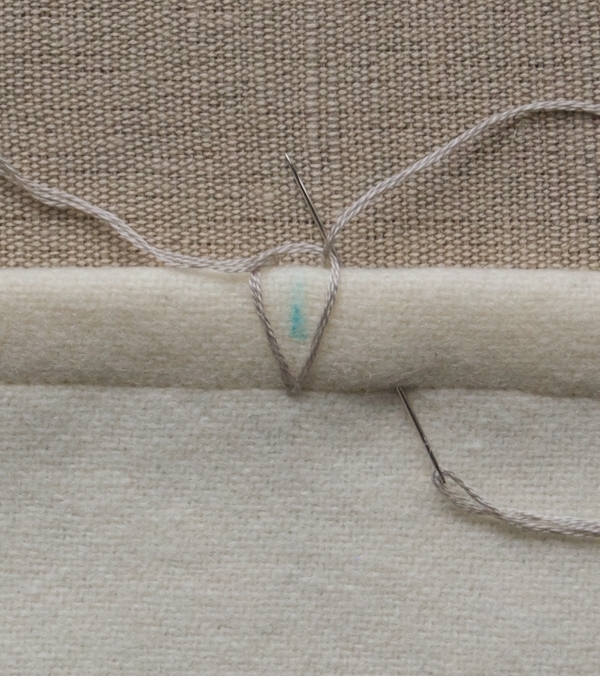 Pull the needle through, leaving a 4-inch tail, just as you did at the beginning of the first length of floss and then continue sewing the zigzag stitch as previously instructed. When you reach the end of a marked section stop using the current color of embroidery floss and switch to the next color in the sequence. Stitch all the way around the blanket in this manner, changing to the next color at every marked point. Once you’re done with all of the stitching, the tails from the beginnings of each length of floss will still be visible. 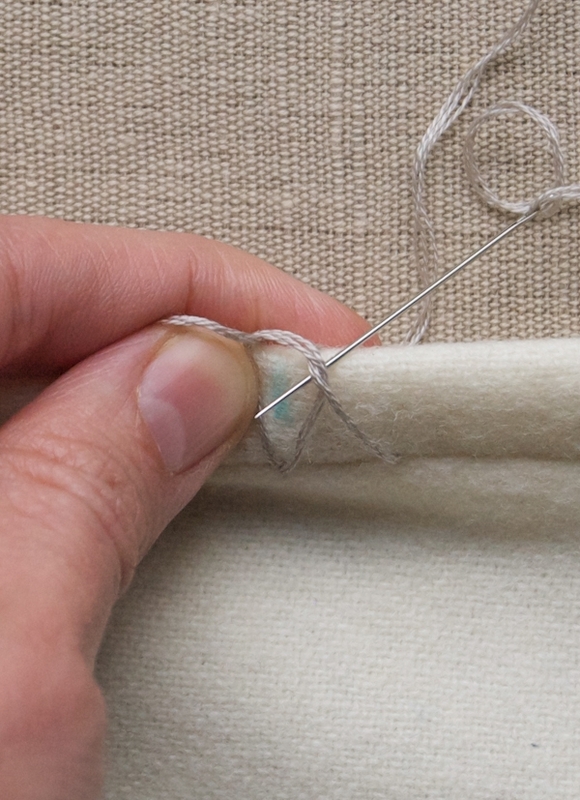 Hide them by tying a small overhand knot at the top of the nearest stitch, pulling the tail through the hem, and snipping off the tail at the exit point, just as you did for the end tails. Once you hide all of the tails, you’re all done! This is beautiful. 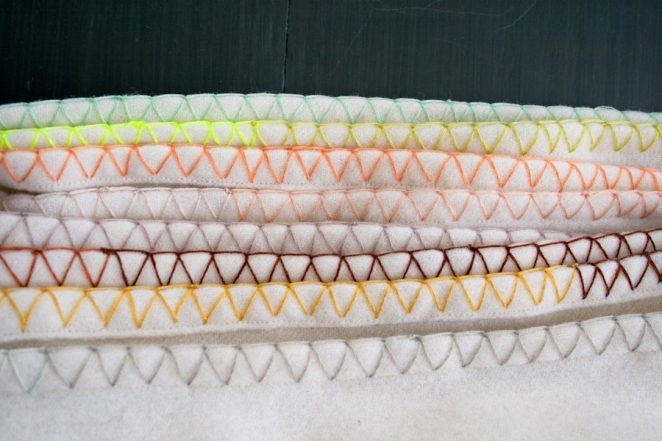 How do you keep your zig/zags so evenly spaced? It's not very hard to get them evenly spaced once you get going in a rhythm but if you are having trouble you can always use the erasable fabric marker to make a mark every 3/8-inch along the seam line, at least until you get the hang of it. Hi Molly the children in our daughters school start with embroidery at the end of kindergarten. It is a tool for the teachers to see if they are ready for first grade and the up-down motion is seen as a preparation for counting. (But now I think of it, they learn finger crochet before that). Your blankets are beautiful thank you for sharing. Have a wonderful weekend. Thanks for that. 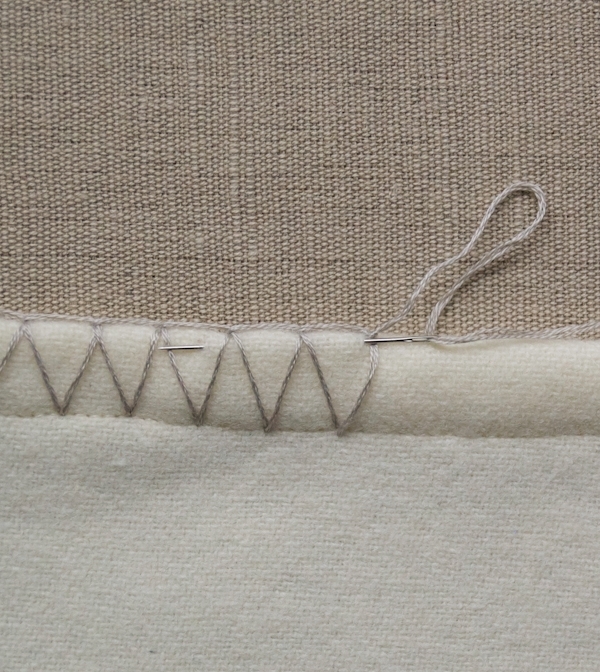 I've always had problems getting a decent looking blanket stitch, but I think this tute just solved all my problems. 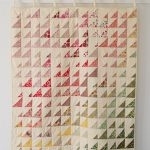 This is lovely and would be very soothing to work on by the fire. Thanks for reminding me that embroidery was likely my first needlework as well, in "Explorers". My little square had several blood stains on it in my best recollection. Next craft was potholders on a loom. Thanks so much for an easy but stunning embroidery project! 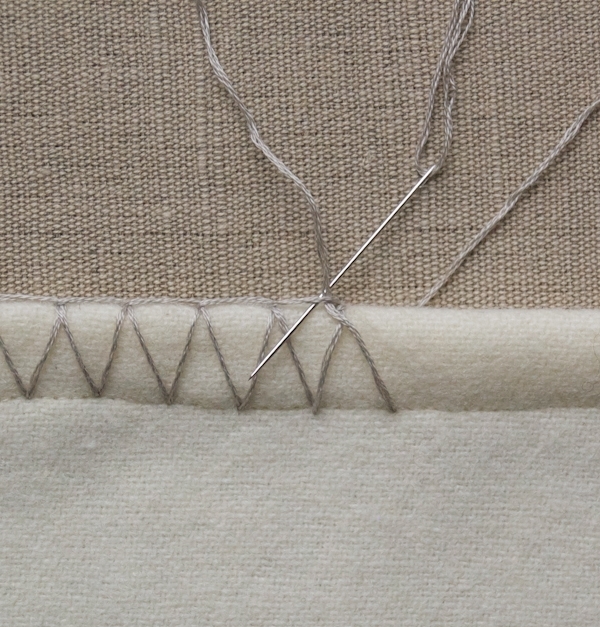 Love the hand-sewing, but not the time commitment of bigger stitching projects. And what a lovely way to play with color! 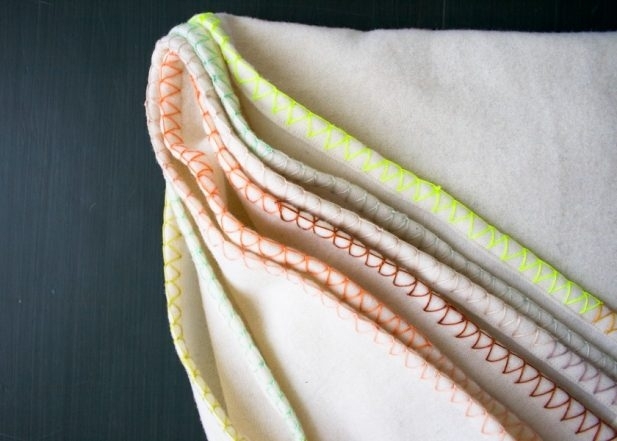 Thanks for sharing this tutorial for a very versatile stitch. 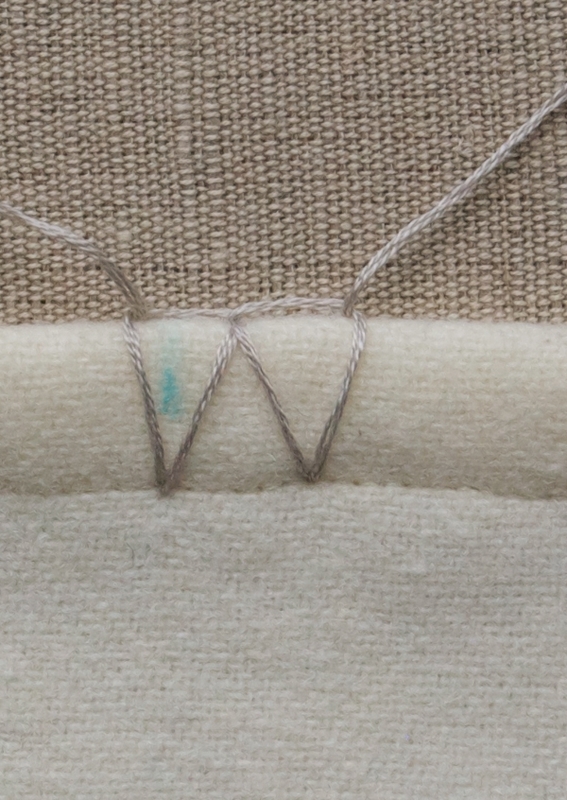 The weave of the wool really helps with identifying stitch parameters. 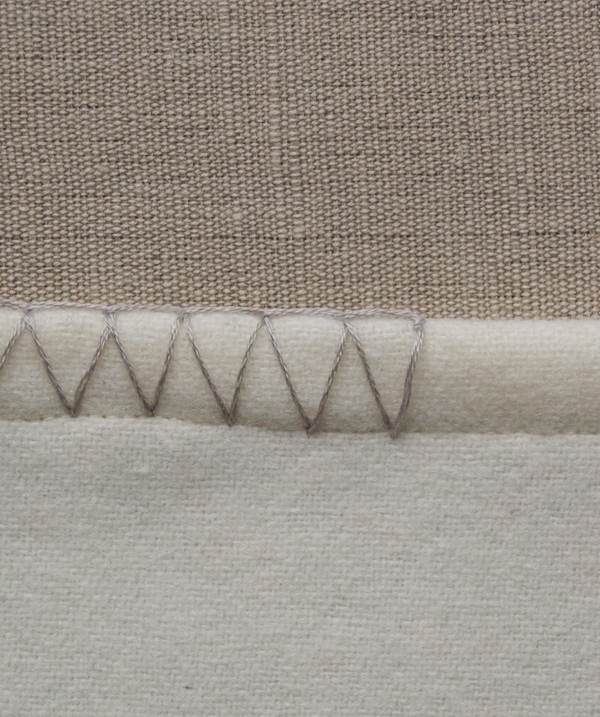 We're all so used to using this stitch as provided on most sewing machines that we forget how easy it is to create by hand and how stunning the results can be! I just have to do this nice embroderi. 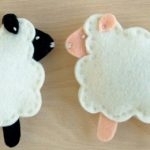 Nice blogg an thanks for all your sharings. Hi! I love this blanket! Thanks for the instructions! Only thing…I can’t see the instruction images…I just get a spinning pink circle where each should be…I’m at the point to begin my embroidery, but want to make sure I’m doing it correctly. (Tried 2 different browsers too…and my phone). Thanks so much for pointing this out to us! We are trying to get it fixed now. It should be working soon! I have a ( overcast plate to put in my machine, I think I can try that , what do you think!! I don’t have any experience with using an overcast foot for something like this but it seems like it’s worth a try. I might not hem it in that case since I doubt that the overcast stitch will be big enough to encase the hem. Also, make sure to do a little sample first before you start sewing on your final fabric. Follow the easy on-screen instructions to delete whichever parts of the pattern you don’t want to print or save. For example, you may decide to shorten the pattern by omitting certain images or the list of materials. You will be able to save as a PDF from this page. Thanks a lot for sharing, much appreciated! 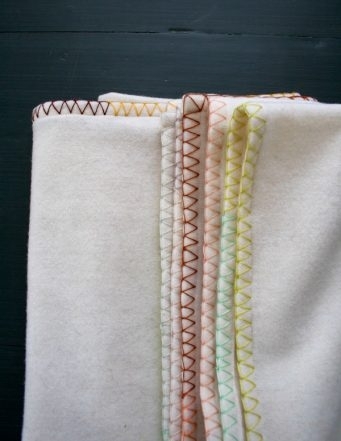 I’d love to make this project and am wondering how practical the resulting blanket is — what would you recommend for washing the blanket once it’s done? Hi Summer! Thanks for writing in! 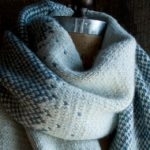 We love the Dorr Mill Wool Yardage for its incredible beauty and strength. Machine washing this will result in some felting. 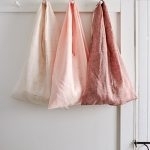 To minimize the effect of felting, we recommend pre-washing your fabric on delicate and line drying. 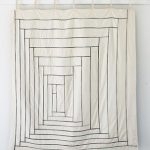 After you’ve completed the project, washing on delicate, hand washing or dry cleaning would be the suggested ways to maintain the life of this beautiful blanket. We hope this helps! Happy sewing! Hello! 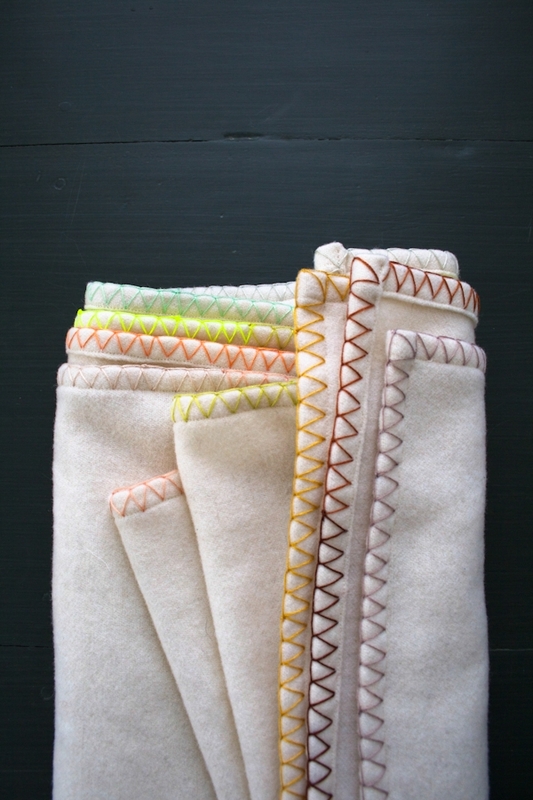 The blankets are beautiful and will be fun to make. Two friends have babies on the way so these will be perfect. Do you think if I use double flannel with more strands of embroidery floss be ok? I would like the floss colors to stand out more, especially with using bright colors. 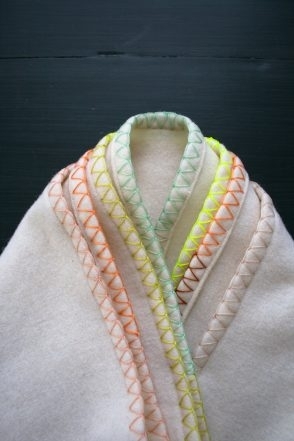 How many strands of embroidery floss can you recommend That would look good and where the strands won’t separate when the blanket is washed? Thank you! Thanks for reaching out and your idea sounds lovely! 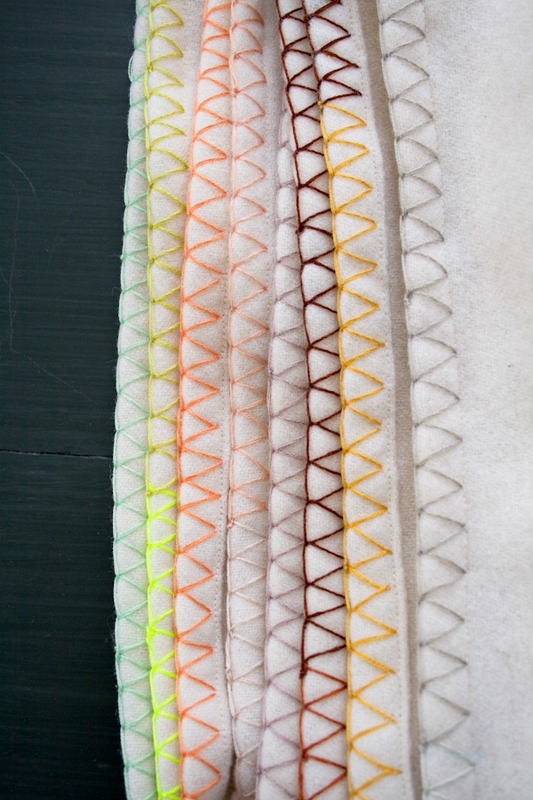 I think you could certainly use a full undivided embroidery floss, which should be six strands, without any problems.